Slide from Becky Mitchell’s presentation at the recent Water Course shindig from the Hutchins Water Center. Presentation slides and some streaming links for the Hutchins Water Center’s recent 3-evening Water Course are now posted here. Topics included CO Water Law, Impacts of Drought & Aridification, and Drought Contingency Planning, and we had a stellar slate of speakers. Westwide SNOTEL basin-filled map January 12, 2019 via the NRCS. Last year was a bad water year in Colorado and the Colorado River Basin. A record-low snowpack on the Grand Mesa and the rest of our high country was followed by low streamflows, stressed fish, and thin hay harvests. 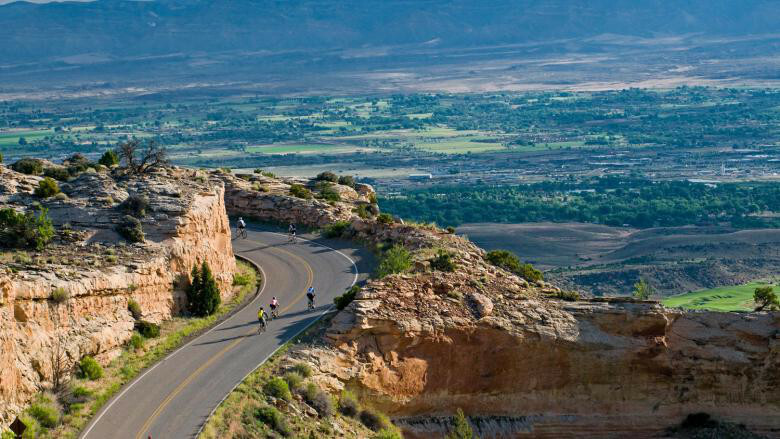 The Grand Valley was spared the worst, thanks to senior water rights and upstream reservoir storage, but the city of Grand Junction got nervous enough to impose outdoor watering restrictions for the first time. In the Colorado River Basin, the combined storage in all Colorado River Basin reservoirs dropped to 47 percent of capacity last year. Runoff into Lake Powell was only 43 percent of average. In 2018, we also heard scientists saying that we weren’t just experiencing a drought, but a long-term process of aridification. With drought, you can expect that better days lie ahead. With aridification, not so much. Water leaders in the states that share the Colorado River seemed to be coming to terms with its limits, as draft “drought contingency plan” (DCP) documents were circulated. The draft DCP sets out a plan for water delivery cuts in the lower basin states of Arizona, California and Nevada and the authorization for a special pool in Lake Powell to save voluntarily conserved water from the upper basin states of Colorado, Utah, Wyoming and New Mexico. This pool would help keep lake levels high enough to generate hydropower and ensure that the upper basin states stay in compliance with downstream delivery obligations. Approval of the plan got hung up in Arizona, however, which faces the twin challenges of having to take the only immediate, severe cuts under the plan and the need to get approval from its state legislature. This led the Commissioner of Reclamation to issue a stern warning that if all the Colorado River Basin states don’t approve the DCP by Jan. 31, she will initiate federal action to make the delivery cuts necessary to keep reservoir levels from crashing. So, 2018 wasn’t exactly a banner year for water decision-making, any more than it was for snow. How is 2019 looking? Hydrologically much better, although not quite better enough to rid the region of drought. Locally, we have a normal amount of snow on the Grand Mesa. The mainstem Colorado River Basin in Colorado, on which most Grand Valley agriculture depends, is even a hair above average for this time of year. The Gunnison Basin is at about 96 percent. The southwestern Colorado river basins have about three times the water in their snowpack that they did at this time last year, but it’s still only 78 percent of average. 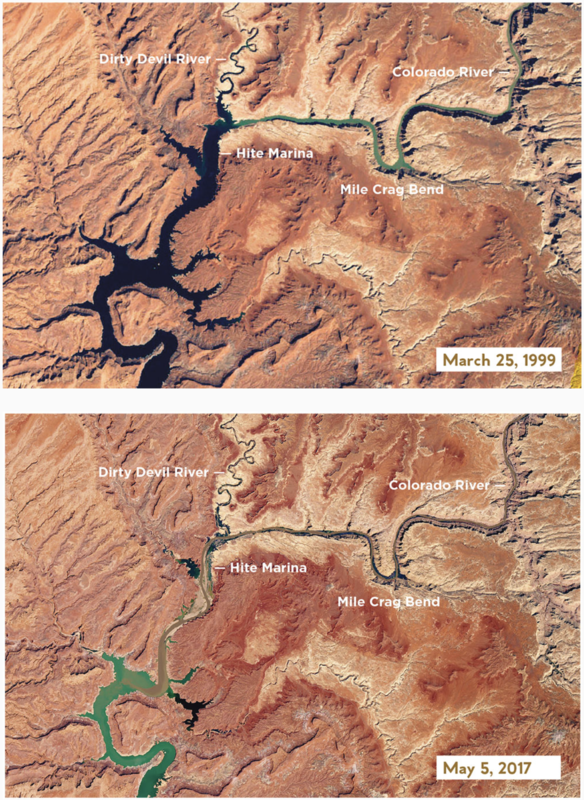 Long-range forecasts show continued drought, and spring runoff into Lake Powell is forecast to be just 66 percent of average. There’s a lot of dry soil out there to soak up snowmelt before it can reach rivers and streams. In terms of water decision-making, it’s way too early to make any judgments on how 2019 will stack up. We don’t yet know if stemming overuse in the lower basin will be done collaboratively or only through top-down federal action. Closer to home, our decent snowpack is giving us time to carefully and deliberately make the kinds of water decisions that can help our communities stay ahead of crisis. Promising work is underway on many fronts. The Colorado Water Conservation Board will be working to develop a voluntary, compensated “demand management” program to cut water use and protect water levels in Lake Powell. The board will be seeking input, and it will be up to us to provide it in order to make sure any such program doesn’t hurt more than it helps. Stakeholder groups are working to better understand their water supply vulnerabilities through integrated water planning projects, in hopes of identifying ways to improve resilience. Ditch companies and individual farmers continue to move forward with efficiency projects to make the best use of every drop, and many residential property owners are replacing lawns with native plants. Whether these efforts will add up to enough to keep us out of trouble with our downstream obligations and keep our communities vibrant remains to be seen. It will depend in part on our luck with the snow, and in part on how much energy and careful thought we put into the kinds of efforts described above. Hannah Holm coordinates the Hutchins Water Center at Colorado Mesa University, which promotes research, education and dialogue to address the water issues facing the Upper Colorado River Basin. Support for Hutchins Water Center articles is provided by a grant from the Walton Family Foundation. 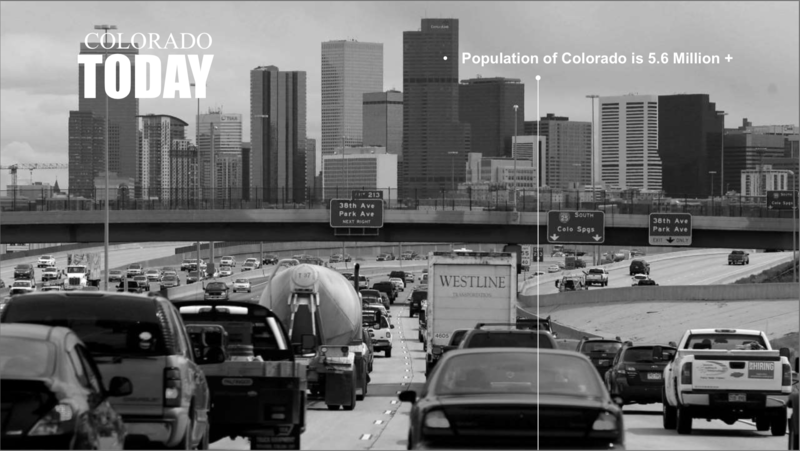 You can learn more at http://www.coloradomesa.edu/water-center. Holiday storms that dumped snow across the state have built the snowpack in the northern mountains of New Mexico to normal or near-normal levels. 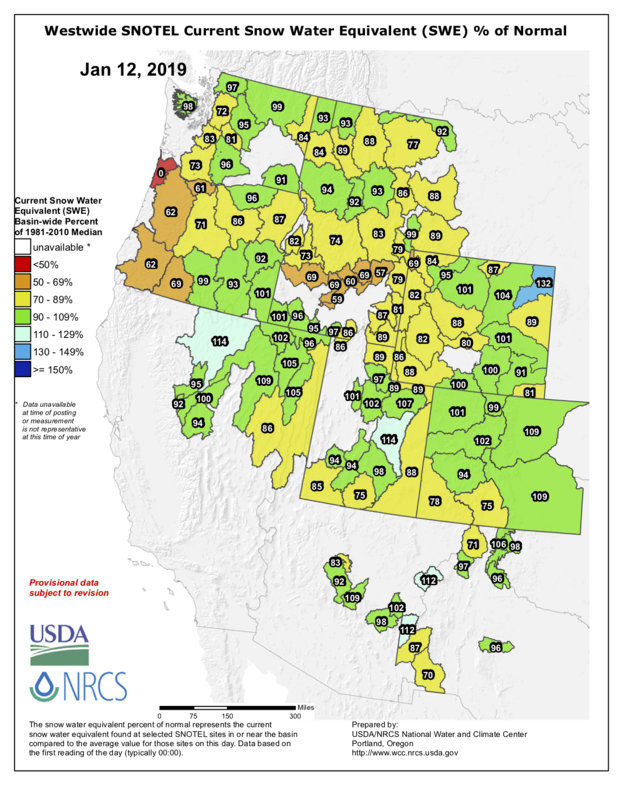 The U.S. Bureau of Reclamation on Friday reported that snowpack in the Sangre de Cristo Mountains, which feeds the Rio Grande, was 106 percent of its median level over a period of 30 years and snowpack in the Jemez River Basin was 97 percent of normal. Snowpack in the Rio Chama Basin near the Colorado state line was 71 percent of normal, and the Animas River Basin was about 85 percent. The San Juan River Basin in Colorado and New Mexico has about 73 percent of its median snowpack. The Upper Rio Grande Basin was also at 73 percent of normal. 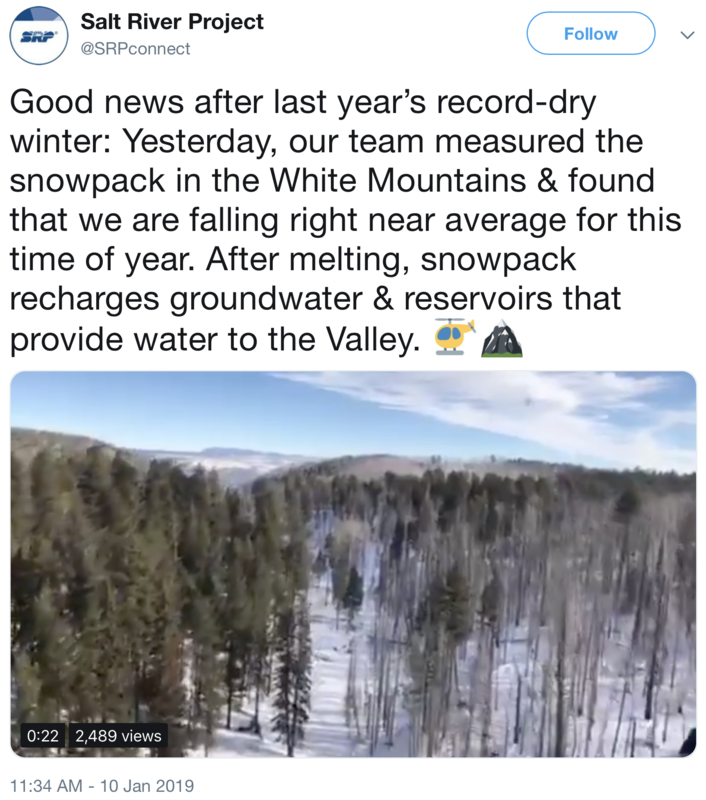 Snowpack in New Mexico and southern Colorado feeds New Mexico’s reservoirs, rivers and streams during spring runoff and provides water for irrigation and recreation. It’s measured in snow-water equivalent, which reflects the amount of water contained in the snowpack at a location if the entire snowpack were to melt. A Colorado River Drought Contingency Plan to keep water levels in Lakes Mead and Powell from crashing has inched towards completion, as state agencies and key interest groups have endorsed the draft plan over the past month. Endorsing organizations include Nevada water agencies (as reported by the Las-Vegas Review Journal), the Colorado Water Conservation Board and the Colorado River District (despite some reservations, as reported by Aspen Journalism and the Grand Junction Sentinel). Arizona, typically seen as the lone potential hold-out among the states that share the river, has recently made major steps towards an agreement, according to the Arizona Republic. Earlier, the Desert Sun reported that a conflict in a California irrigation district could still complicate adoption of the agreement. The head of the Upper Colorado River Commission on Tuesday told a Grand Junction audience that proposed new interstate agreements contain important provisions aimed at helping fend off the short-term threats that drought poses to the region. Amy Haas, the commission’s executive director, says the centerpiece of the new deals from the perspective of Upper Colorado River Basin states is a provision providing for storage in Lake Powell and other Upper Basin reservoirs for water that might be conserved through any demand management program in the Upper Basin. “There’s no point in implementing and administering a program in the Upper Basin without that storage capacity,” Haas said at the forum. The event was hosted by the Grand Valley Water Users Association and hosted at Colorado Mesa University by CMU’s Hutchins Water Center. It focused on drought contingency planning, demand management and the potential implications for Western Slope agriculture. Importantly, Haas said, the newly reached agreements spell out that water conserved through a demand management program could be used only for purposes of complying with a 1922 river compact between upper and lower basin states. It wouldn’t be subject to releases from Powell under the language of an interim agreement reached in 2007 that seeks to balance water levels between Powell and Lake Mead downstream. The recently released draft agreements, which officials say will require federal enabling legislation, include a drought contingency plan for Upper Basin states and another for Lower Basin states. A key aspect of the Upper Basin plan entails possible implementation of a demand management program if agreement can be reached between Upper Basin states. 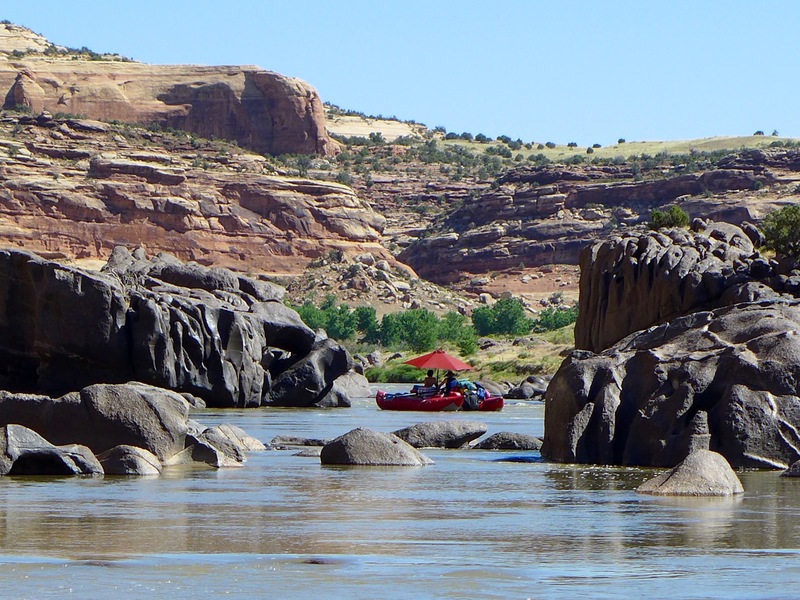 The Colorado River District, a 15-county Western Slope entity, has been concerned that addressing the storage element now might pave the way for demand management before proper discussion has taken place on what parameters such a program should have. The district fears that demand management could end up primarily targeting West Slope agriculture. It wants any program to be limited to voluntary, temporary and compensated measures, with the impacts borne equally across varying regions of the state and water users. The Colorado Water Conservation Board has directed its staff to develop a draft policy guiding development of any demand management program in the state. Haas called that “an expensive endeavor.” She said a demand management program would need to conserve 200,000 to 500,000 acre feet of water to make a difference, and questions surround how to fund that. On October 23, 2018 Grand Valley Water Users Association is providing an opportunity for West Slope agricultural producers and irrigation providers to hear directly from water officials concerning current and upcoming policy issues that will impact the future of water management and agriculture on the western slope. Please see the attached agenda to see the complete list of confirmed influential decision makers who will be joining us. At the top of the list is Amy Haas, the new Director of the Upper Colorado River Commission, who will share an Upper Basin perspective. Ms. Haas will be followed by representatives from the State of Colorado and some of our regional Water Conservation District Managers. Between the two perspectives Eric Kuhn will provide an update on the Basin Risk Study III and the potential implications of the results. We hope you can join us for this unique opportunity to hear from a very well informed group of water community professionals who have the tough task of hammering out solutions to ever increasing pressures on Colorado River water supplies in Colorado and the Upper Basin. The solutions that are created and implemented will affect us all. Our focus is on agricultural water users. So Irrigation District, Association, Ditch Company, and agricultural organization managers, staff, boards of directors, members, and stockholders are all welcome. Farmers and ranchers are particularly welcome. You can find a complete agenda here. Please register no later than October 15 to let us know you are coming, and spread the word. Thanks and we hope see you on October 23. Which brings us to today’s topic: How do we prepare tomorrow’s decision-makers today, when we can’t be sure what tomorrow is going to look like? This is the trial facing the Colorado Water Workshop held annually at Western State Colorado University in Gunnison. This spring the workshop marked its 44th gathering by asking a select group of participants, most with long ties to the workshop, to look to the future and decide possible options for the workshop to follow. Even though the WSCU gathering is older than most, if not all, of its competitors, there are plenty of the latter. At last estimate, 11 similar workshops are conducted around the state. And they all (but for one or two notable exceptions) are cookie-cutter reproductions of “water geeks talking to other water geeks,” as one CWW participant said this year. And why attend the WSCU conference if it doesn’t provide something different? He called it a “retooling” of the workshop aimed at increasing involvement of WSCU students and connecting them to established water leaders and those water managers (a very broad category) early in their careers. Which eventually boiled down to the existentialist question of why and for what does the conference exist? OK, that’s two existentialist questions. The 30 or so participants seemed to agree that inviting “water geeks” (and you know who you are) to talk arcane language and hydrologic philosophy to similarly inclined devotees has its place and certainly provides opportunities for education, although perhaps only to like-minded adherents. But does it reflect the best option for Western State and its role in the future of water education and management? 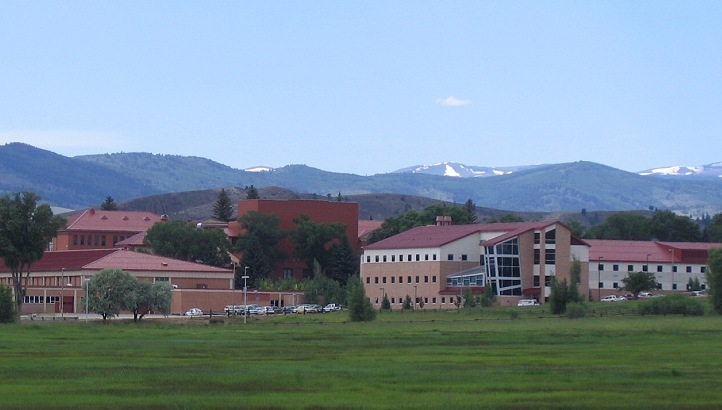 Education seems to be the key and that, said John Hausdoerffer, director of the school’s Center for Environment and Sustainability, remains the provenance and function of Western State Colorado University. “What is it we add to the conversation?” Hausdoerffer asked during a thoughtfully taxing presentation. Focusing on the generations of students that will be needed to make effective decisions, Hausdoerffer urged the conference to explore at least 10 years ahead, developing the tools and skill sets needed to deal with climate change and similarly perplexing hurdles. These include communicating with the public, dealing with rapid environmental and climatic changes, and most of all, continuing to learn and adapt. “Who have we been educating and who do we want to educate?” posed George Sibley, author and former Colorado Water Workshop director and a well-respected voice in Colorado’s water matters. Education, he said, necessarily involves breaking away from the old regimes and means involving new voices. Some of those voices were heard from the handful of past and current WSCU students at the workshop, predominantly female and well-spoken on what they need to be successful in what is a mostly male-dominated field. And don’t be afraid to “cross-pollinate” among academic disciplines with collaboration and the sharing of educational resources, said Hannah Holm, coordinator for the Ruth Powell Hutchins Water Center at the Colorado Mesa University. In closing, Jeff Sellen said educational institutions sometimes must “swim upstream against cultural currents” in developing answers to present and expected conditions.